We have a winner! 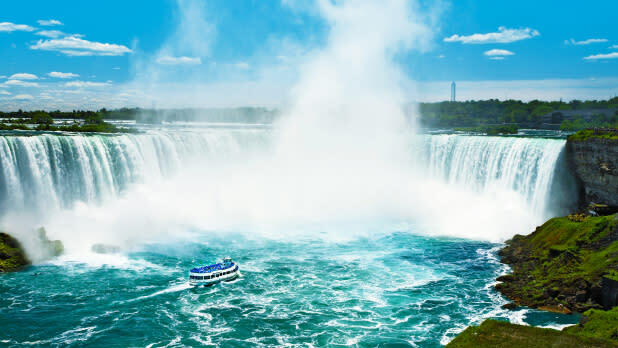 In ILOVENY.com&apos;s fourth annual Bracket, we rounded up some of the most popular and beloved destinations across New York State to find the #1 fan choice and YOU chose Maid of the Mist, the iconic boat tour of Niagara Falls USA! Stay tuned for news about the lucky winner of the annual Bracket sweepstakes, who will get to select one of the amazing travel packages listed below in the guide to this year&apos;s contestants. Read on to see where you should plan your next New York vacation! There are plenty of ways to enjoy Niagara Falls, but the most thrilling is to ride the legendary Maid of the Mist boat tour right up to the rushing water. You’ll need the provided poncho because you will definitely be sprayed by the 600,000 gallons (!) of falling water. A 30-minute tour brings you to the base of American Falls and then to Horseshoe Falls for a rare chance to gaze up at this magnificent world wonder. Win this! Four roundtrip JetBlue flight certificates to any New York airport where JetBlue flies (subject to terms and conditions); four tickets to Maid of the Mist, four encounter passes for Niagara Falls State Park, four tickets to Niagara Jet Adventure Tours, and a two-night hotel stay at the Sheraton Niagara Falls with continental breakfast. Come watch drippy molten glass magically take shape in a live demonstration at the Corning Museum of Glass—one of many memorable experiences you’ll have at this venerable institution, founded in 1951 by Corning Glass Works. 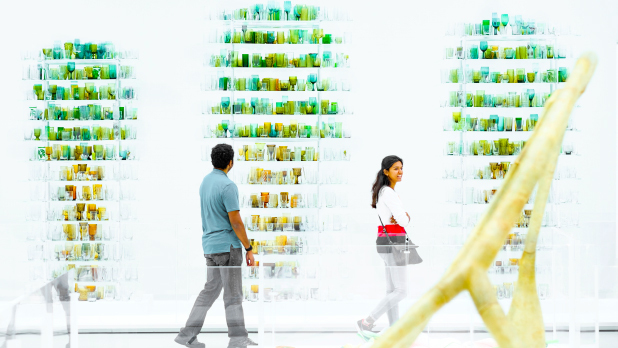 The museum’s collections include pieces of glass art from the time of ancient Romans up to contemporary glass artists like Dale Chihuly. Plus, you can actually try your own hand at glasswork: the museum offers family-friendly Make Your Own Glass experiences, or if you prefer to watch, the Hot Glass Shows are narrated so you can learn all about this ancient craft while master glassblowers transform blobs into art before your eyes. Win this! Four roundtrip JetBlue flight certificates to any New York airport where JetBlue flies (subject to terms and conditions); a two-night hotel stay for four in Corning; two dual admission tickets for four to the Corning Museum of Glass and the Rockwell Museum; Glass Making Session for four; up to $200 in reimbursement for rental car expenses while in Corning area. Calling Letchworth State Park the "Grand Canyon of the East” makes sense in that it’s a massive canyon, but the name doesn’t do it justice. 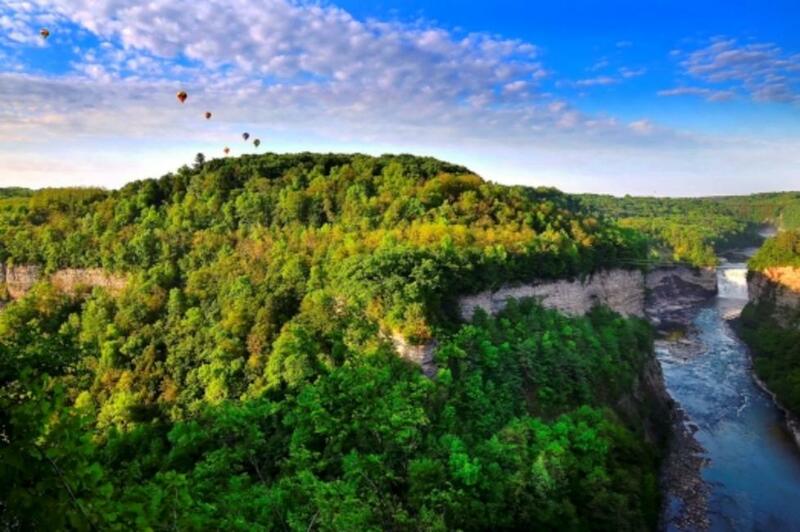 Unlike its Southwestern sister, Letchworth magically transforms with each season. During warmer months it’s completely plush and green, then stunningly multicolored in the fall, and finally a frosty winter wonderland. The Genesee River rushes through the gorge, divided into three beautiful waterfalls, one of which crashes down a 600-foot drop. 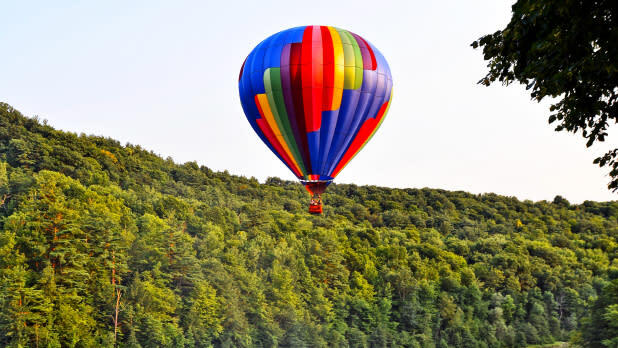 The park is great for camping and hiking, but if you’re looking to try something a little more adventurous, whitewater raft through the canyon or splurge on the breathtaking experience of riding in a hot-air balloon above it. Glide peacefully through the air enjoying 360-degree views of New York’s natural beauty. Win this! Four roundtrip JetBlue flight certificates to any New York airport where JetBlue flies (subject to terms and conditions); a two-night stay at Allegiance B&B in Mount Morris with two queen rooms for four (Package must take place between the months of June through September); two continental breakfasts for four; one dinner for four at the Glen Iris Inn in Letchworth State Park overlooking the grand Middle Falls; one dinner for four in the area at the Questa Lasagna in Mount Morris ; a tethered balloon ride in/above Letchworth State Park or Finger Lakes Region for four (subject to weather, other attractions/experience will be offered if balloon is unable to take flight. ); guided White Water Rafting on the mighty Genesee River for four guided hike through Letchworth State Park for four. 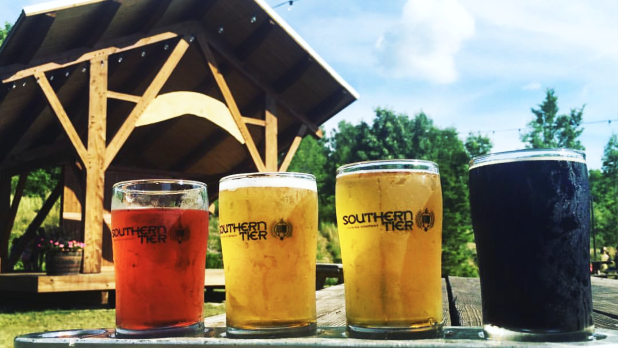 Southern Tier Brewing Company has grown from a small production in the woods outside of Lakewood into one of the largest craft brewers in the country, with taprooms in four cities and beers sold in more than 30 states. Founders Phineas DeMink and Allen “Skip” Yahn started brewing to honor the region’s tradition of beer-making, and their delicious IPAs, ales, and stouts have found a healthy fan base. Visit the taproom in Lakewood, where you can enjoy a pint or a beer flight outdoors in the beer garden with delicious pub fare. On Saturdays, you can attend an afternoon tour of the brewery (spoiler alert: it ends with beer samples!). You can also enjoy your beer as you try playing “Stones,” a hybrid of bocce and golf. Win this! Four roundtrip JetBlue flight certificates to any New York airport where JetBlue flies (subject to terms and conditions); a one-night stay for four at the Chautauqua Harbor Hotel; a $30 meal voucher to the Lakehouse Tap & Grill; a Hilarious Getaway package that includes tickets for four to the National Comedy Center and Lucy-Desi Museum; a private tour of the Southern Tier Brewing Company and some keepsake brewery swag; four pairs of Groucho Marx keepsake glasses; four $25 gift cards to the National Comedy Center. Make your kids’ dreams come true without buying them their own horses. Just take them on a getaway to the 2018 TripAdvisor Travelers’ Choice award-winning Rocking Horse Ranch Resort. The Ranch offers an all-inclusive stay with so. much. to. do. They have horseback riding options for all skill levels, including ponies for your little one. Splash around in the enormous indoor waterpark, check out the arcade, go mini-bowling, enjoy live performances by musicians and comedians, and learn new skills at the archery range. You can also venture out into the surrounding nature and gardens, and sit by the lake. Win this! Four roundtrip JetBlue flight certificates to any New York airport where JetBlue flies (subject to terms and conditions); a one-night all-inclusive stay for four (with two queen beds and a set of bunk beds) at Rocking Horse Ranch. 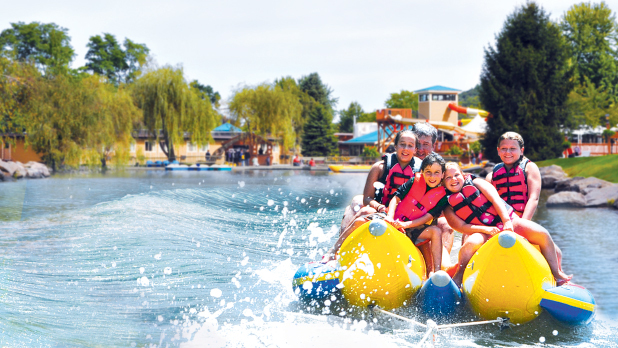 Package includes unlimited access to its activities such as horseback riding, seasonal outdoor activities, Big Splash Indoor Waterpark with four slides, spray geysers and dumping buckets, Mini-bowling in the Lucky Horseshoe Arcade, the Fun Barn, live shows, nightly entertainment, and more. 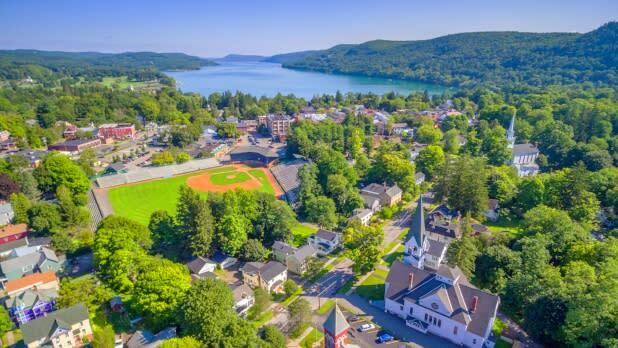 Baseball fans everywhere make the pilgrimage to the world-famous National Baseball Hall of Fame in Cooperstown. Walk the great hall with more than 300 plaques dedicated to legendary players like Babe Ruth, Ted Williams, and Hank Aaron, and newer HoF inductees like Vladimir Guerrero and Gary Carter. Exhibits are filled with memorabilia from the sport’s signature moments. This year’s Hall of Fame weekend takes place July 19–22, with the induction ceremony of the newly elected Hall members, including Yankees great Mariano Rivera, on July 21. There will be an award presentation, a Parade of Legends, and discussions with players and well-known alumni. Just be sure to book your lodging well in advance. “Hall of Fame” gets thrown a lot, but this is the Hall of Fame that started it all. Win this! Four roundtrip JetBlue flight certificates to any New York airport where JetBlue flies (subject to terms and conditions); a two-night hotel stay in two rooms for four at The Cooper Inn with continental breakfast; triple-play tickets good for 2019 admission to Fenimore Art Museum, The Farmers’ Museum, and National Baseball Hall of Fame; National Baseball Hall of Fame & Museum Sustaining Membership including personalized membership card, subscription to Memories and Dreams magazine, Hall of Fame Yearbook, Hall of Fame Almanac, complimentary admission to the Hall of Fame for one full year, for two adults and their children (up to age eighteen (18)) or member and three guests, 10% discount and free shipping on purchases from Museum Store and website, and two member lapel pins. Clayton is an amazing destination for families seeking out lighthouses, art galleries, distilleries and wineries, nature trails, and time on the water in the scenic Thousand Islands. 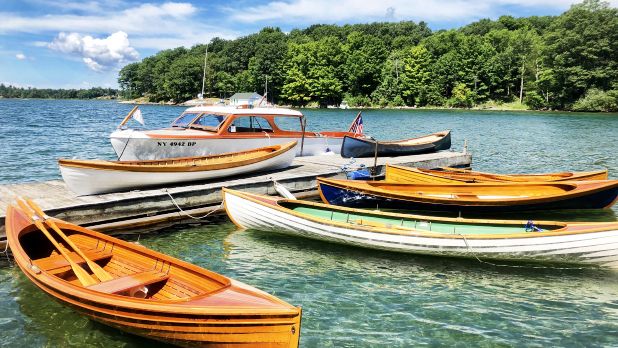 The whole crew will enjoy a stop at the Antique Boat Museum, where you can peruse more than 300 historic and contemporary boats and learn about the history of watercraft! The next step is to get out on the water. Take the family on river and sunset cruises on the museum’s antique boats, or make plans to attend the 55th annual Antique Boat Show August 2–4, which attracts boating enthusiasts from around the world. Win this! Four roundtrip JetBlue flight certificates to any New York airport where JetBlue flies (subject to terms and conditions); a one-night hotel stay for four in a double queen room at the Thousand Island Harbor Hotel in Clayton; four passes to the Antique Boat Museum including admission to La Duchesse and a speedboat ride for four; four passes aboard the Two-Nation Cruise with stop at Boldt Castle; admission to Boldt Castle; a $100 gift card toward dinner. Only an hour from NYC, Long Beach serves up world-class waves from hurricane swells sweeping up from the Caribbean in the fall and winter. 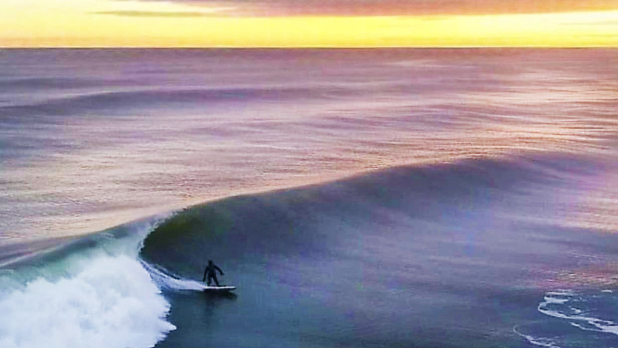 If you’re a novice or looking for some smaller waves, hit the beach in the summer. And if you’re brand new to surfing, the certified instructors at Skudin Surf will show you the ropes! Even non-surfers will love Long Beach, from its sandy beaches to its 2.2-mile boardwalk. Don&apos;t miss the annual Pride On The Beach celebration being held June 21–23. Win this! Four roundtrip JetBlue flight certificates to any New York airport where JetBlue flies (subject to terms and conditions); a one-night stay for four at the Allegria Hotel; a surfing lesson for four at Skudin’ Surf. What’s so magical about the Walkway over the Hudson is that it’s really long, the longest elevated pedestrian bridge in the entire world, in fact, stretching a whopping 1.28 miles, so you can savor the experience. 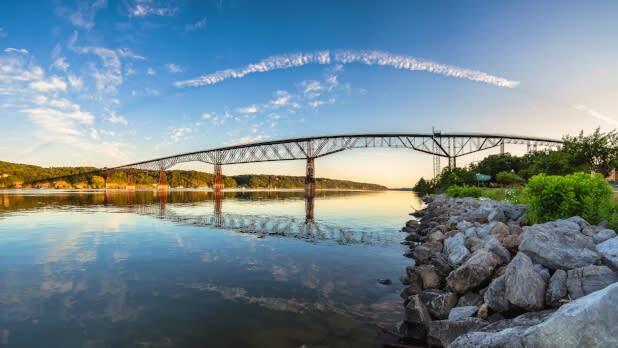 It connects Poughkeepsie to the town of Lloyd, offering panoramic views from 212 feet above the Hudson River. Add in a picnic on the Poughkeepsie Waterfront or a stroll through Franny Reese State Park at the other end. You can also explore the Walkway Loop Trail, guiding you through historic and natural landmarks on both sides of the bridge. Win this! Four roundtrip JetBlue flight certificates to any New York airport where JetBlue flies (subject to terms and conditions); a two-night stay for four at the Holiday Inn Express Poughkeepsie; a visit to the Walkway Over the Hudson; a tour for four of Locust Grove in Poughkeepsie; a tour and tasting for four of Plan Bee Farm brewery in Poughkeepsie; dinner for four at Essie’s Restaurant. What the High Line did in New York City, the Wild Walk does for the forest—it creates a brand new experience by elevating your path. Strolling comfortably amongst the treetops is notably different from say, climbing a tree, or even flying over the forest. You can relax, take in the scenery, and notice details in nature from a new angle. Enjoy life from a bird’s point of view, while exploring fun features like the human-sized “nest,” and “spider’s web.” Besides the Wild Walk, you can wander the trails covering 115 acres, either on a naturalist-guided tour or on your own. 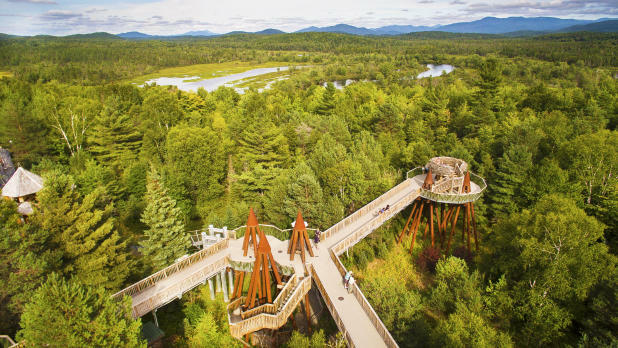 Then head inside the Wild Center to meet animals like porcupines and owls and see Earth from space in real time with the special “Planet Adirondack” display. Win this! Four roundtrip JetBlue flight certificates to any New York airport where JetBlue flies (subject to terms and conditions); a one-night stay at The Faust Motel of Tupper Lake for four; admission tickets for four, good for two consecutive days, opens for season May 3, 2019, weather-permitting, days vary based on seasonality; The Wild Center canoe trip–two adults and two children per boat (Canoe trips are daily from July 1–August 31 from 2 pm to 4 pm. Pre-registration is recommended. Paddles, boats, and lifejackets are all provided. This experience is tailored for paddlers of all experience levels, ages 5 and up. Children (ages 5–15) must be accompanied by at least 1 adult per 2 children. The trip includes a 1/2 mile walk to and from the river. ); a $25 gift card to use in store. 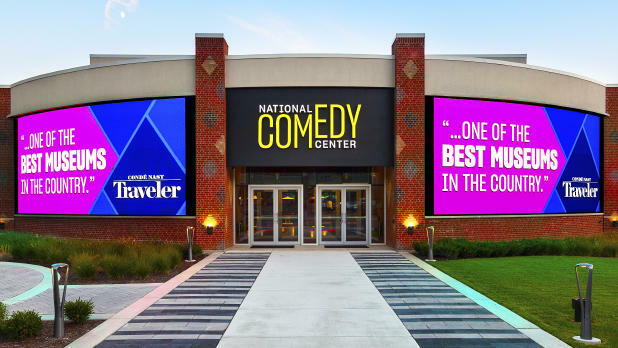 The National Comedy Center is the first museum entirely dedicated to the art of comedy, and it has cemented Jamestown, birthplace of legendary comedian Lucille Ball, as the home of all things funny. Whether you’re an avid comedy fan or just enjoy a good laugh, this museum has something for you. The 37,000-square-foot museum boasts more than 50 exhibits spanning all genres from slapstick to vaudeville to Internet memes! Many of the exhibits are interactive, such as stations that invite you to try stand-up karaoke or perform classic routines of the greats. Try to plan your visit around the annual Lucille Ball Comedy Festival, which takes place August 7–11. 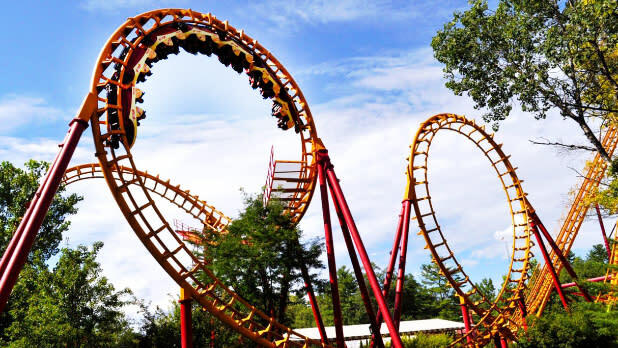 Daredevils and their families will have a blast with one of the most fun-packed adventures you can have this summer, at Six Flags Great Escape Resort in Queensbury. This massive theme park and indoor/outdoor water park is home to 135 rides and attractions, so count on full days of excitement. Feel like putting your stomach to the test? (Hey, to each, their own.) Try the Dare Devil Dive, a bungee-jumping experience, or the Sasquatch, which drops you from 192 feet into the air. Or you can always just take it easy on the lazy river. Whatever floats your boat, the whole gang will love this sweet escape. Win this! Four roundtrip JetBlue flight certificates to any New York airport where JetBlue flies (subject to terms and conditions); a two-night stay for four at the Six Flags Great Escape Resort, and two-day park admission tickets for four. Looking for adventure back on land? Hit the longest jump trail on the East Coast (a trail with lots of large bumps that cause you to “jump” in the air on your bike). 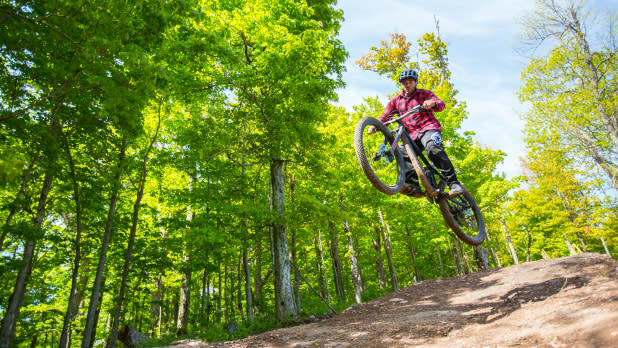 Serious mountain bikers and even ambitious amateurs flock to the Windham Mountain Bike Park, designed and developed by experts and nestled in the gorgeous Catskill landscape. Here you’ll find routes for all skill levels. There’s even a Skills Park where newbies can practice all the moves before graduating to a green trail, the biking equivalent of a bunny slope. Best of all, many of the trails are serviced by a chairlift so you can save your energy and skip pedaling uphill. You might think you know apples...until you’ve tried New York apples in the fall. Apple season is the perfect time to visit the 104-year-old Beak & Skiff. 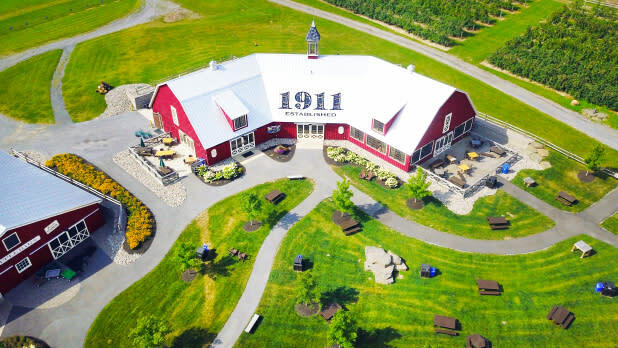 USA Today has rated this family farm the #1 apple-picking destination in the country multiple times, and for good reasons. Spend a day in their gorgeous orchards picking more than a dozen varieties of apples to take home. Then shop freshly baked apple cider donuts, apple pie, and other delights. Anyone 21 and up can’t miss a visit to the tasting room, to sample apple wines, hard ciders, and homemade spirits. Meanwhile, kiddos can roam the playground and take pony rides. From tree to cider mill to cider house and distillery, you can taste spirits made 100% on premises. How do you like them apples? Win this! Four roundtrip JetBlue flight certificates to any New York airport where JetBlue flies (subject to terms and conditions); a two-night hotel stay for four in Syracuse; four admission tickets to the Rosamond Gifford Zoo, with its most recent addition, a baby Asian elephant; dinner for four at Pastabilities in Downtown Syracuse’s Armory Square; four Passport to Savings booklets from Destiny USA; $150 in Uber or Lyft credit toward transportation. It’s off to the races at Saratoga Race Course! The world-famous destination opened up in 1863, making it one of the oldest racetracks in the country. The track has been dubbed the House of Upsets, because legendary horses like Man o&apos; War and Secretariat both suffered losses here, so who knows what can happen? The season kicks off in July and includes 40 days of exciting thoroughbred racing. Place your bets—or just try to make a lucky guess. You can book picnic tables, single seats in the grandstand, or bring your own lawn chairs to enjoy the spectacle. Win this! 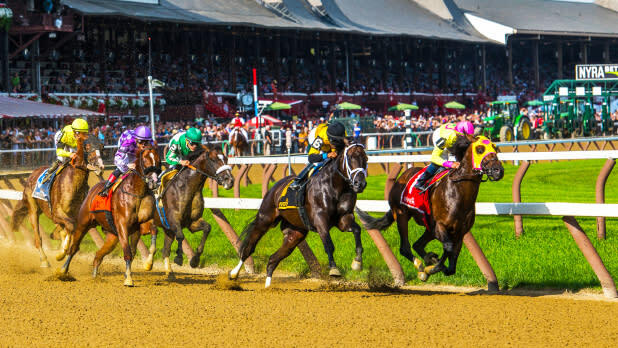 Four roundtrip JetBlue flight certificates to any New York airport where JetBlue flies (subject to terms and conditions); a two-night hotel stay at The Downtowner; season pass admission to Saratoga Race Course starting May 1st 2019. Rather than gaze upon the art as you would at a museum, you walk amongst it at the incredible Storm King Art Center, the sprawling sculpture park-on-steroids that features rotating works as well as permanent installations by renowned sculptors including Richard Serra and Maya Lin. Its 500 acres of land in the Hudson Valley, just an hour from NYC, make for the perfect escape from all enclosed spaces. The sculptures themselves are immense, turning your photos into surreal works of art in themselves. 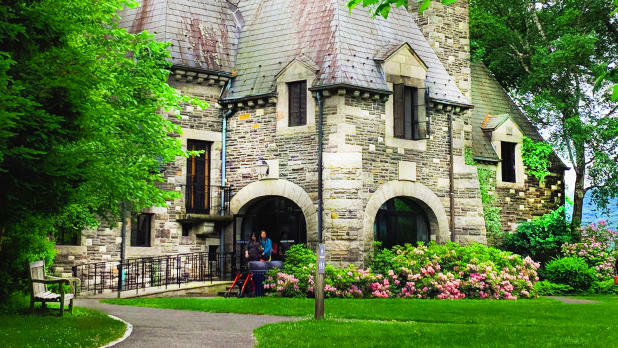 The museum rents out bikes if you’re not up for a long walk, and offers a tram tour of the grounds as well, making Storm King accessible to every kind of art lover. Win this! Four roundtrip JetBlue flight certificates to any New York airport where JetBlue flies (subject to terms and conditions); a two-night stay in a deluxe king bed room for four (4) at The Historic Thayer Hotel at West Point (Blackout dates for May–October 2019 are: May 22–25; June 30–July 1; August 16–17; August 29–31; September 20–21; October 4–5 and October 25–26); four admission passes to Storm King Center (must be used April 3rd–November 10th, 2019); one $100 gift card to be applied to any amusements or food at the Castle Fun Center (Zipline, rides, go-karts, laser tag, roller skating, Ballocity, rock wall, arcade and mini-golf, Jesters Restaurant & Pub).